It’s actually cool this morning on the South Shore of Nova Scotia. It’s 7am and just over 10°C. Blessed relief. That’s a far cry from what it’s been over the past several days. All this warm weather is certainly justification for our purchase of a barbecue (finally) last week. It certainly is much nicer in the house without having to use the stove to cook. 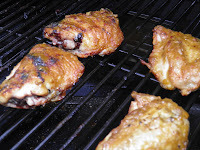 Yesterday’s barbecue foray was chicken thighs. We’ve been having quite a few sausages lately but it’s now time to start to work our way through the freezer a little. It’s a good thing to buy several packages of whatever’s on sale and tuck them away. It’s a bad thing to leave them there. That was the story of the chicken thighs. You really can’t pass up a bargain of $5 for six. So the big question was what do with them and what to put on them. The answer was in the weather. It was too hot to cook inside. So barbecue it was. But it’s nice to mix things up a bit. Barbecue sauce can become a little boring unless it’s really good. 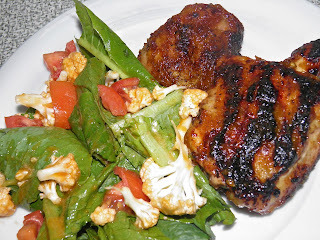 I’ve made and wrote about several standard tomato-based barbecue sauces on this blog. Usually they’re of the “pantry-surfing” variety. It’s always good to use ingredients that you already have, and almost everyone's kitchen already has everything you would need. When I opened the pantry this time the first thing I saw was dried apricots. Fruit-based barbecue sauces are somewhat unusual and can be quite delicious. “Sweet” and chicken go together quite well. It’s true of beef and pork as well. It didn’t take long for me to google and find several apricot-based sauces. The one I settled on to “rip apart” (in my own unique way...) was Asian. What I ended up with wasn’t Asian in the least. 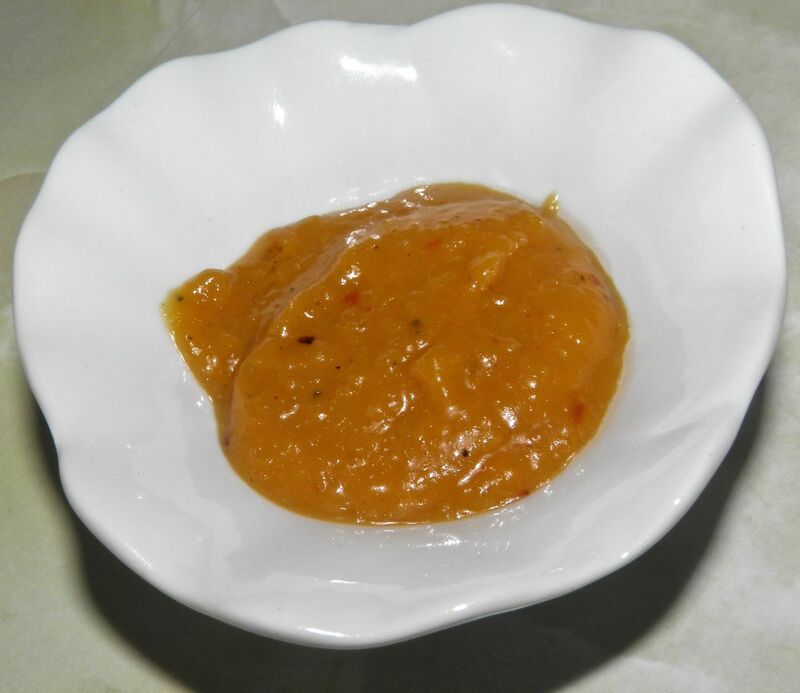 This is also a “raw” sauce. So you don’t even have to turn on the oven to make the sauce. Most sauces call for “cooking down” after everything is combined. This one cooks on the barbecue. I’m no master on a barbecue. I’m quite good at broiling chicken in the oven, but a barbecue mystifies me a little bit. I guess it’s because there’s no real “set” temperature on them. It can be a little intimidating. A common problem many of us have when barbecuing is burning the sauce. Many of us – me included – make the mistake of putting barbecue sauce on as we start to cook. It’s actually supposed to go on for the last few minutes. Almost all barbecue sauces contain high levels of sugar. Sugar burns very easily, resulting in the charcoal/charring none of like as an end result. So you need to know when your chicken is nearly “done” to calculate backwards. You also need to turn the temperature down once the sauce goes on so it is less likely to burn. Some sources say to 225°-250°C. 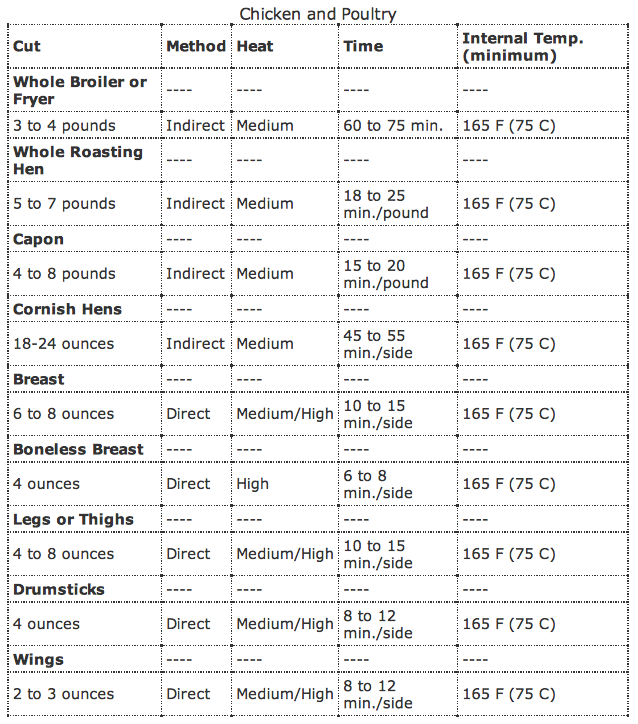 I found the following very useful chart on allrecipes.com. 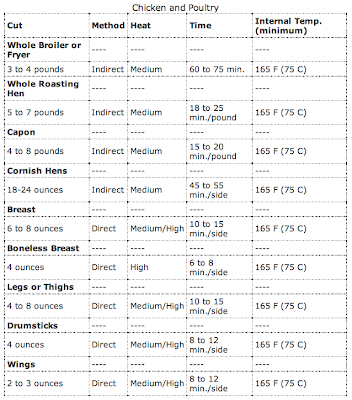 It gives info on different chicken cuts, method of cooking and temperature to make sure you don’t end up with dry meat, or worse, lumps of coal. The link to the full page is here. I read info from a few sites (besides above) before grilling the chicken. Several called for the temperature with lid down to come to about 350°C before you season your chicken pieces and slap them on the grill. We have a three zone barbecue (3 burners), that comes in very handy. You set two at the heat you need to cook and either leave the third one turned off or on very low. That way you can control what you’re grilling. If some pieces are cooking too fast in relation to others, just move to the cooler spot on the BBQ. One thing I do know is to not leave the barbecue unattended once the sauce is applied. I went in the kitchen just long enough to tear up some romaine for a salad and almost had a disaster. Luckily I caught them in time. The sauce still tasted of all its flavours. It complemented the chicken and salad very nicely. You still should test your internal temperature with an instant-read thermometer. It’s indispensable. You can adjust the heat level in this sauce. I’ve listed two amounts for the chilli flakes. If you want a sauce with a little more kick add the full amount. You won’t regret it. 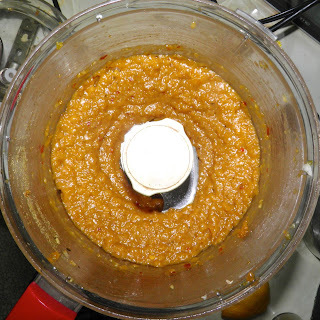 Place the apricots in a food processor and pulse until chopped. Then add the onion and garlic and pulse again until finely chopped. 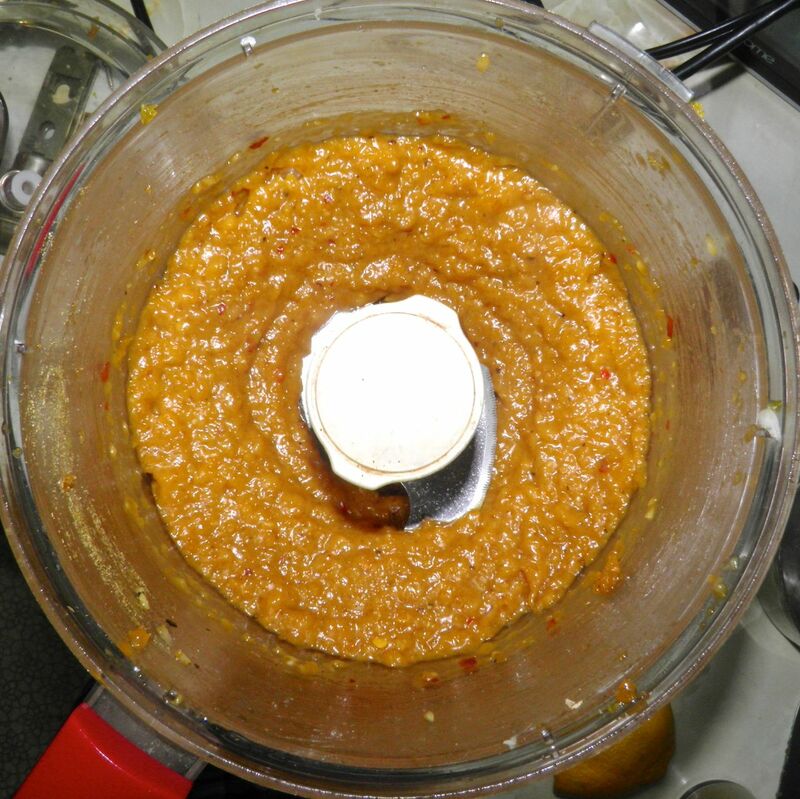 Then add the remaining ingredients and purée until smooth. If it’s too thick for your liking add a little water. The sauce does need to be thick enough to stay put when you brush it on.